Presumably, ETS means that its reported national test scores are uninformative about the average national CAs of nations. If this is the case, we would not expect ETS’s scores to be predicted by national CAs indexed by international achievement and/or IQ tests. We explore this matter. (2) L&V’s (2012) geographic plus racial based method of inferring unmeasured National IQs has frequently been challenged (e.g., Hunt and Sternberg, 2006). 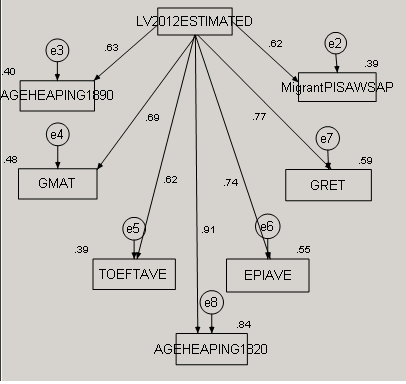 We previously used GMAT scores to assess the validity of the inferred scores. We wished to see if we could replicate the previously found results. Crayen and Baten (2008) found that the relationship between illiteracy and age heaping for Less Developed Countries (LDCs) after 1950 is very close. They calculated age heaping and illiteracy for not less than 270,000 individuals that were organized by 416 regions, ranging from Latin America to Oceania. The correlation coefficient with illiteracy was as high as 0.7. The correlation with the PISA (Programme for International Student Assessment) results for numerical skills was even as high as 0.85, hence the age heaping measure Whipple Index is more strongly correlated with numerical skills. A’Hearn, Baten, and Crayen (2009) used the large U.S. census sample to perform a very detailed analysis of this relationship. They subdivided by race, gender, high and low educational status and other criteria. In each case, they obtained a statistically significant relationship. Remarkable is also the fact that the coefficients are relatively stable between samples, i.e. a unit change in age heaping is associated with similar changes in literacy across the various tests. Those results are not only valid for the U.S.: In any country studied so far which had substantial age-heaping, the correlation was both statistically and economically significant. We explore this issue further using L&V’s National IQ estimates. This thinking fits nicely with another study that found that PISA scores of immigrants are more similar to their home countries than their host countries (Canabana 2011, see also Levels and Dronkers 2008). Indeed, if this weren’t the case, something would be seriously amiss [with a hereditarian hypothesis] since PISA and measured national IQ correlations are so strong. No one has yet systematically tested whether or not national IQs can predict migrant by nation of origin performance. We make a preliminary attempt here. National Cognitive Ability: See previous post. English Usage: See previous post. GRE: GRE (Graduate Record Examinations) by citizenship scores came from ETS’s reports, “Snapshot of the Individuals Who Took the GRE® revised General Test 2011-2012; 2012-2013)”. As the GRE report included only countries with a test taker number of 30 or more, and as we used two years of data, all countries scores were based on at least 60 test takers. TOEFL: TOEFL (Test of English as a Foreign Language) by citizenship scores came from ETS’s reports, “Test and Score Data Summary for TOEFL® Internet-based and Paper-based Tests (2010, 2012)”. We used the internet based scores. Concerning sample sizes, as in the case of the GRE, each citizenship group had at least 60 participants. 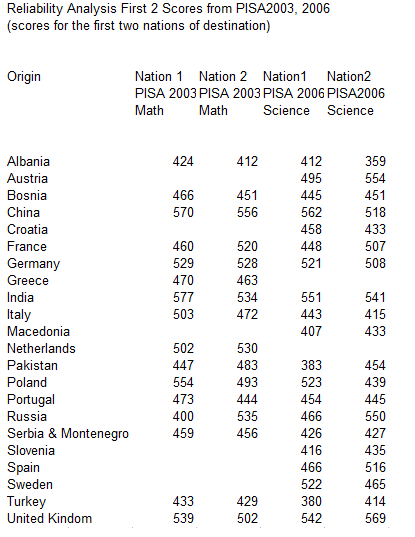 Migrant PISA: Migrant PISA scores by nation of origin were computed by n-weighting the PISA 2003 math, PISA 2006 science, PISA 2006 reading, PISA 2009 math, and PISA 2009 reading scores presented in Levels, et al. (2008), Dronkers, et al. (2011), Dronkers, et al. (2012b), Dronkers, et al. (2012a), and Dronkers and Kornder, N. (2013). References are given in the excel file. Numeracy (Age Heaping): The 1820 birth cohort age heaping rates come from Baten and Juif (2013), appendix E; the 1890 birth cohort rates were estimated based Baten and Crayen’s (2008) color coded global map (Figure 4, replicated below). Countries were given a rank of 0 to 6, with 0 having the lowest age heaping rates (and so being the most numerate). Baten (2014, personal communications) informed us that his complete age heaping data base would be made available around March 2014. Analysis 1. 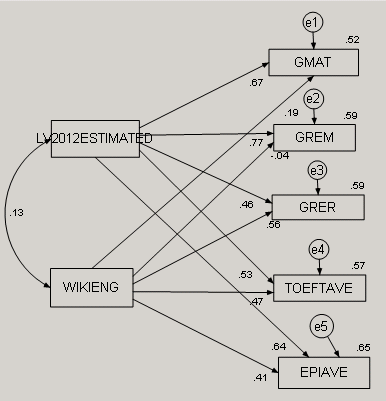 LV’s 2012 NIQs, GRE, TOEFL: The correlation matrix and path diagram is shown below. GRE verbal and TOEFL scores were, as expected, associated with national English usage rates; GRE math seemed to act as a relatively linguistically unbiased measure of national cognitive ability. 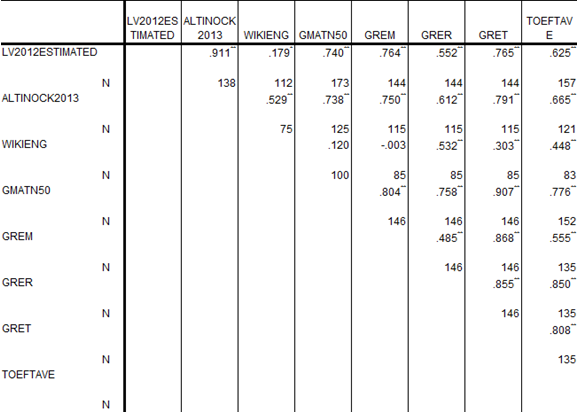 The regression plot for LV’s 2012 NIQs and GRE-Math is shown below. Analysis 2. 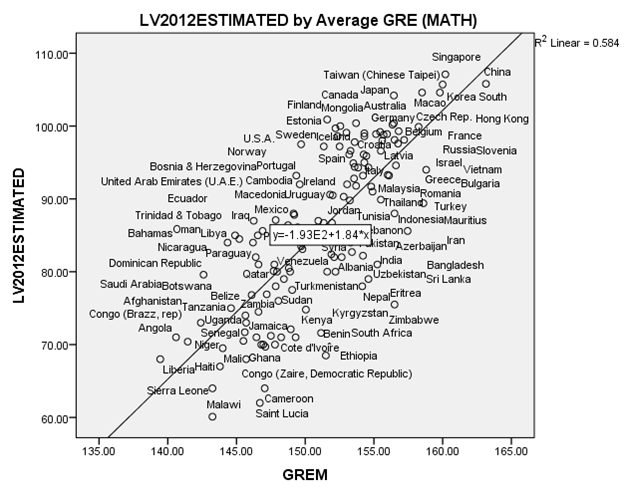 LV’s 2012 NIQs (estimates only), GRE, and TOEFL: GRE and TOEFL scores were correlated with L&V’s (2012) estimated values in exclusion of the measured values. The correlation was highly significant at, respectively, 0.69 (nations=15) and 0.69 (nations=23) and not significantly different from the correlation based on the measured values alone. 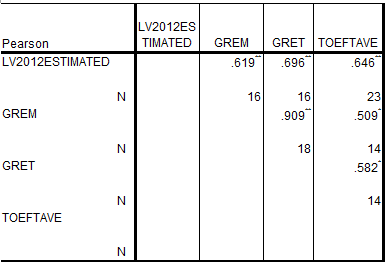 Thus L&V’s (2012) estimation method is again validated. Analysis 3. 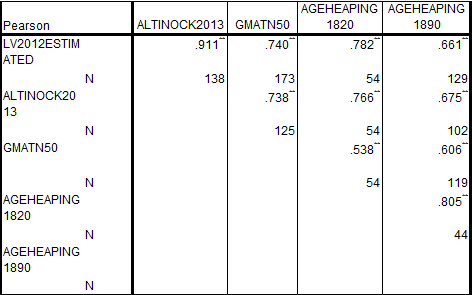 LV’s 2012 NIQs and 1820 and 1890 birth cohort age heaping scores: The correlation matrix is show below. 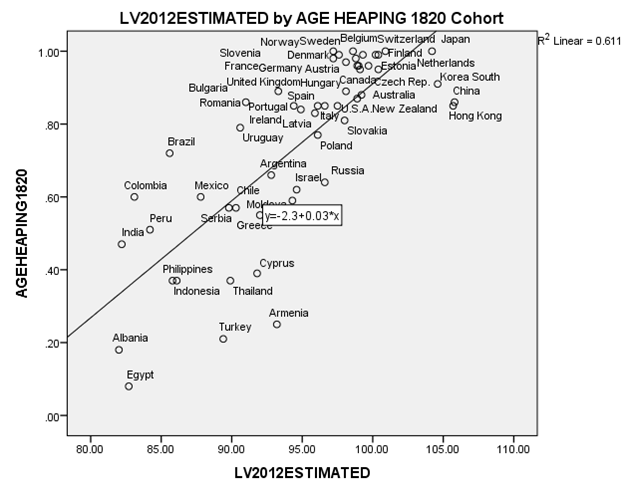 1820 and 1890 birth cohort age heaping significantly correlated with LV 2012 NIQs. Regression plots are also shown. Migrant scores from a given county correlated across years, tests, and nations of destination. Below shows, for example, the first two PISA 2003/2006 scores for every national migrant group looked at that had representation in multiple destination nations. The typical Pearson correlations were around 0.6. The intraclass correlations (i.e., if one were to conduct a reliability analysis) were higher. Thus, as scores for the same national diaspora don’t vary willy-nilly, it’s meaningful to speak of National Migrant IQs. Migrant IQs non-trivially correlated with L&V’s NIQs. 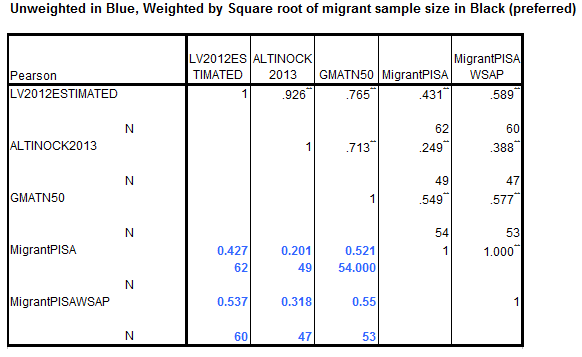 For the full 62 sample the correlation was 0.43 (unweighted) and 0.43 (weighted by the SQRT of the migrant sample sizes). The two largest outliers were African emigrants to Australia and to Portugal. These migrant groups happened to be predominantly European (White South Africans relocating to Australia and Portuguese retornados returning to Portugal). Insofar as we are testing a hereditarianism hypothesis it makes sense to either exclude these cases or to recode them with the appropriate sub-national IQs (e.g., White South African IQ = 94). 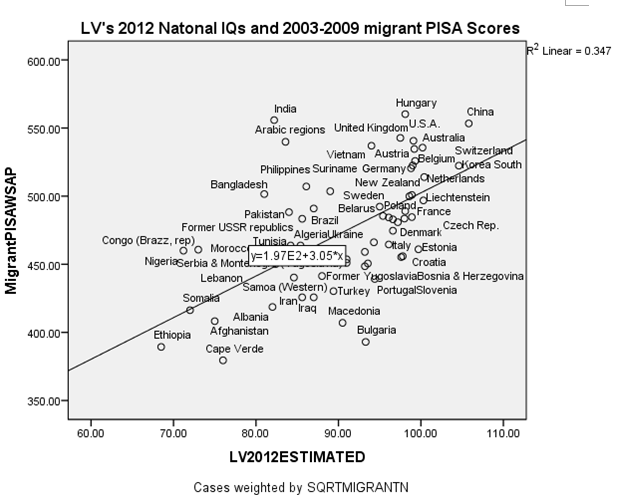 Excluding these data points (MigrantPISAWSAP = Migrant PISA without South Africa and Portugal) increases the NIQ – migrant PISA correlation to 0.54 (unweighted) and 0.59 (weighted); recoding the National IQs has nearly the same effect. The correlations were lower (and, at times, non-significant) when using Altinok et al.’s (2013) national achievement estimates and the GRE-M estimates, but not using the others. 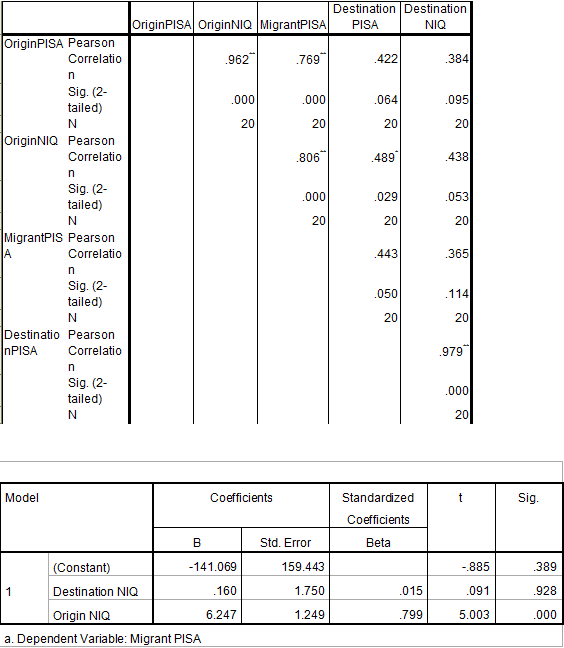 For a limited set of data reported by Carabana (2011) there was sufficient information to look at the relation between migrant PISA scores, destination National IQs, and Origin National IQs. For these twenty countries, the correlation matrix is shown below, followed by the regression results. Nation of destination IQ explained, independent of nation of origin IQ, none of the Nation of origin – migrant PISA scores association. Summary analysis: we depict the relation between LV2012’s NIQs and the seven dependent variables discussed here and in the last post. Missing data was handled with Maximum Likelihood Estimates using AMOS. 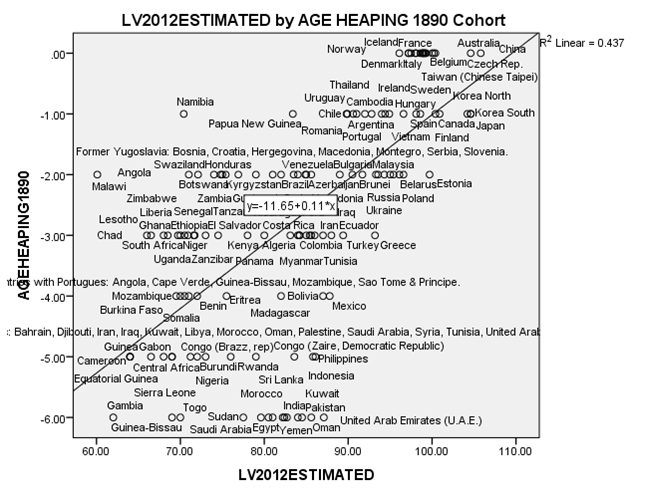 L&V’s 2012 NIQs are robust predictors of global variation in cognitive ability. We extended previous research by showing that they statistically explain a large chunk of the national and citizenship variation in GMAT, GRE, TOEFL, and English proficiency scores. The GMAT and GRE results are of particular interest because the meta-analytic results indicate that GMAT and GRE scores are more or less comparably predictive of outcomes for national, international, native English, and non native English students (Kuncel, et al. 2001; Kunzel et al. 2007; Talento-Miller, 2009). Replicating and adding to the analysis of Baten and Juif (2013), we showed that LV’s 2012 NIQs predict 19th and early 20th century ethnic/national differences in numeracy. Thus, their cognitive predictivity extends back in time. Finally, we have provided tentative systematic evidence in support of Canabana’s (2011) position that national origin IQs non-trivially predict first and second generation migrant PISA performance. Lynn’s national IQs seemingly extend across political states. The contemporaneous predictivity of national IQs on the level of the political state (e.g., GDP, crime, patent rates) has been well explored. Future research needs to focus on the historic predictivity of these measures and predictivity on the individual between state level. How well, for example, do contemporaneous national IQs predict ethnonational levels of ability in the 1600s to 1950s? How well do they predict first and subsequent generation migrant performance? We suggest that the heap of age heaping data should be taken advantage of to explore the first question. The second question can be explored using international surveys such as PISA.